I have been in Europe now for over three months and wow, have I seen a lot, done a lot, and learned a lot! I am going to try and focus this blog post more on the places I have been, the journey, and the many important thing that I have learned along the way, instead of purely on hard out climbing. But we shall see how it goes. Hopefully you guys will learn something too. I started my open ended European tour in no-wear else but within the magical southern Alps of France. What an amazing countryside. After a day of confusing train rides and multiple hitchhikes the huge cliff band of Ceuse was in site. Driving to the campground gave me an amazing feeling, making me realize how amazing this place is! I remember saying to my self "wow, I could see myself living here..." Clean blue skies, awesome French food, amazing climbing, and the odd sky diver plunging towards the ground. What more do you need! This was my local crag for the next four weeks (almost) and man was i excited to get started! Ceuse, home to some of the best sport climbing in France. How could i not be excited! My first challenge was to mentally prepare my self for the one hour slog up the steep hill from the camp to the base of the cliff. I had heard mixed comments about this from many people, so the only way for me to find out my self what it was like, was to get on with it and do it. Over the course of the the next three and a half weeks I walked up and down this thing like a mad man. The first week was maybe the hardest as it was really warm and i was pretty unfit, but after a while i found my rhythm, plugged my iPod in and i was off! You end up getting so used to it that you are at the cliff before you know it. I cant say it was easy tho! Music really helps. The climbing here is amazing! Long sustained pocketed, slightly overhanging limestone was something so different for me as i had just come straight from the Blue Mountains, Australia were i was so used to climbing on short, steep and powerful routes. It didn't take me to long to get my endurance up to scratch and quickly started working through some of the more classic routes of the area. This was my first stop of many to come here in Europe so i didn't rush in to jumping on to anything super hard to quickly...I new that there was plenty of time for that in the following months. I took my time and tried to work on my flashing and on-sighting more than anything. This was a good way for me to get some good mileage and try and gain some fitness. It meant that i climbed in a lot of different sectors, really getting the full experience of Ceuse. I quickly learned that the so called "easy warm up routes"were not the best to warm up on as they tend to be on the more vertical to slabby angled walls , meaning they were very technical and thin. Not so good for the fingers. Luckily Ceuse has a bit of everything so its never hard to find a steeper, jug pulling route to warm up on. You could call it a warm up..... swinging around waiting for the shade at Sector Biographie PHOTO: Irmak Thompson. I quickly noticed that here in Europe, your never climbing alone at the crag. I had heard it gets busy here but wow, i wasnt expecting this many. I didnt evan know this many people climbed! :) For the first week or so the camp was absolutely full, but this was good. The place had a good vibe to it. Personally i found it quite hard to get used to climbing with so many people around, coming from NZ (and even in Australia) its very rare to turn up to an area and it being chockablock. Evan now after more than three months in Europe i still feel like i am learning how to adjust to this madness. Its different. Having the mind set of not worrying about rushing in to trying anything too hard had it pros and cons. It ment that i did a lot of climbing and got pretty fit, which i really enjoyed but i also began to notice that i was falling in to a trap. A trap where i became so comfortable with just climbing things that i new i should be able to do with in a few tries. Maybe this had something to do with there being so many people around, i didnt have the confidence to try something at my limit and go through the first stages of projecting.? I also felt like every day that i walked all that way i really wanted to be able to walk back down knowing that i have achieved something. Projecting something super hard for me was an intimidating thought because the possibility was there that i would leave disappointed and with nothing done...? At the time i was fine with it, just climbing lots and having fun but now looking back..... I mean come on..... gees... If this ever happens to you just slap your self in the face and just get on with it. Confidence is a major part of climbing, so you cant let these thought get in the way. I don't feel to fussed about it all as i have a suspicious feeling that i am going to be staying here in Europe for a fairly long time (luxuries of a European passport) so after a lot more rock climbing and some more hard out training i am 100% psyched to return to Ceuse much stronger, and now with the classics out of the way i will be able to focus all my energy on the harder stuff! ATTACK! After all i am here traveling around Europe climbing (living the dream) so you cant feel too down about things like this. Im only 18 so there is plenty of time to get strong... except actually, no i really want to be strong NOW! After almost a month of being in Ceuse we all found our psyche levels slowly decreasing. Due to the sun being on the cliff for most of the day there was a lot of sitting around until about three pm. This was the crux of everyday, trying to build up everyone's psyche to get of our butts and face the walk for another time. Going climbing wasn't the problem, everyone was psyched for that but just thinking about the walk made us all fall asleep in our chairs! Most of the time we were all pretty good but towards the last few days we were having far to many rest days so something had to change! Our good friend Jonas was always talking about the Frankenjura... The sentence "short walk ins" was enough and with in 24 hours we had made our decision and were saying good by to Ceuse. 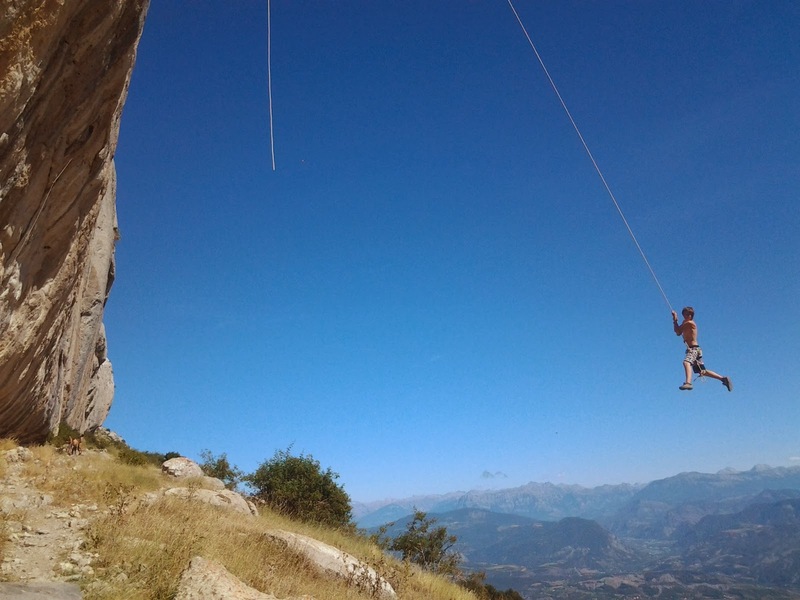 Ceuse is an amazing place to climb but it is important that you approach it correctly! Having a deadline of when you are leaving is important otherwise you will fall in to a trap of " ah...its ok ill just chill for today and climb tomorrow" with this mind set you never get anything done. This is one of the main things i learnt during my time there and will make sure i apply next time i return. 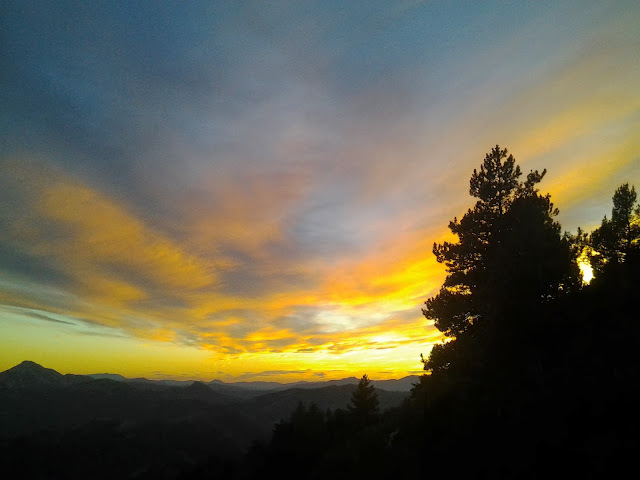 Goodbye Ceuse! Hello the Frankenjura! Next up was Frankenjura. After a long drive we arrived in the forest covered land. Strangely there was no rock in sight..... Hmmmmm are we in the right place...? But yes, hidden within the beautiful, green forest, are some of the hardest sport climbs in the world. Some may say they are not the most inspiring looking lines but they definitely climb well for sure! So the first few days were good and i managed to get some good climbing in. It felt like i was at home again.... short pocketed climbs and with mostly no one else at the crag! it was great, It felt like the confidence that i may have lost climbing in Ceuse was back and i was buzzing with psyche! Lets go climbing!!! Most blue sky we saw the whole trip....Nice day climbing at Elderado. The first few days were great! Confidence and psyche were high, and having a vehicle made it easy to find the dry crags. Unfortunately this had to come to an end after a few days as our good friend "the german" had to return to 'the normal life', having to start uni soon, so we made our selves at home at the awesome Oma eichler camp ground! Hanging around at camp getting miserable and complaining about the weather was obviously not gonna get me strong so something had to be changed. 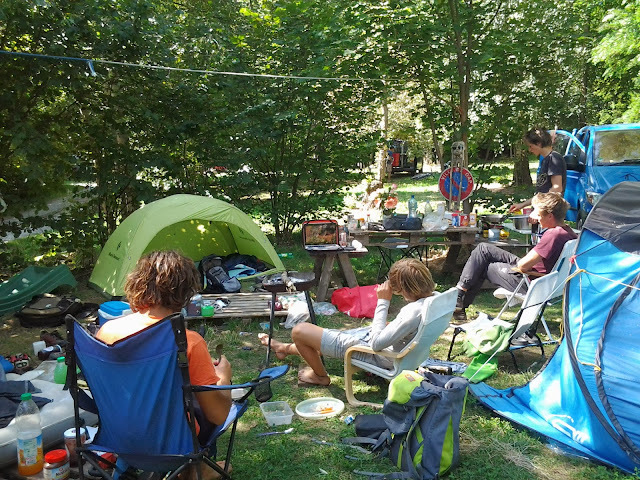 Pretty much everyone else at the camp felt the same and were all heading to Kalymnos, Greece together in a few days so after a bit of umming and arring i decided to join. F@#$ it... lets go climbing. I really enjoyed the little bit of climbing i experienced here in the Frankenjura and definitely knew that i would return, making the decision much easier to leave. On the other hand, the camp mum baked some very amazing cakes.... this was hard to leave behind. So yet another decision had been made and before i knew it i was flying in to the beautiful islands of Greece. This is what i love about Europe.... Its so easy and cheap (most of the time) to travel from country to country, all with amazing climbing to be done.